A.J. Michaels can install, repair or replace your business’ heating system – and cut your energy expenses while we do it. 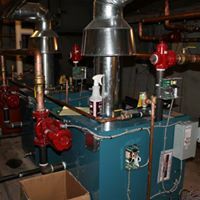 Oil, gas, electric, steam or boiler; ducts or chimneys, anywhere in the central Maryland area, we can handle it. Rooftop systems or central boilers; warm air, steam, oil or gas, nobody is better equipped for the job than A.J. Michaels. Since 1978, we’ve worked on churches, nursing homes, shopping centers, restaurants, apartment buildings – even a cruise ship – more than 35,000 systems so far! In many cases, we may be able to save you 50% or more, as we did at the Ridgemede Apartments. 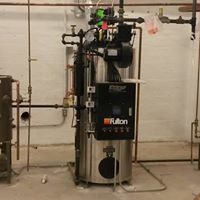 We converted their 80-year-old building from steam heat to hot water heat, and installed a modular system. The most amazing thing? We did that job more than 20 years ago. Imagine how much we could save you with today’s high-efficiency equipment! We routinely handle complex jobs like boiler conversions, retrofitting and installations. We’re also up on the very latest HVAC technology – including the new VRV or VRF variable refrigerant systems, which not only save money, but allow you to adjust temperatures in each individual room or office if you want.